By turns fiercely confrontational, literate, primitive and sweetly melodic, The Velvet Underground remain one of the most influential bands in the history of rock. The ultimate cult band and the ultimate art rock experience, the VU's music and style have served as a blueprint for everyone from David Bowie to The Jesus And Mary Chain. Yet for all their enduring importance, they were unsuccessful in their day, selling minute numbers of records, their monochrome look and photo-realist lyrics at odds with the garish colours and peace fantasies of the hippy era. It was only when David Bowie started to champion the band in the early 70s, after they had split up, that the VU's reputation started to spread. 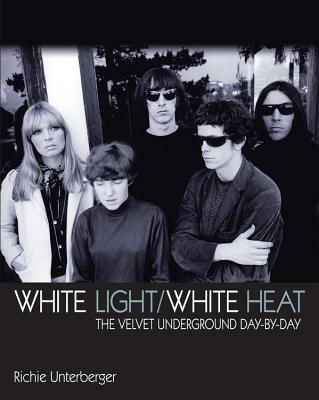 In White Light/White Heat, noted rock writer and historian Richie Unterberger analyses the band's career and influence in forensic detail, drawing on many new interviews with band members and associates, previously undiscovered archive sources and a vast knowledge of the music of the times. The result is a comprehensive, articulate, immensely detailed history, the most thorough work on the band yet published. Richie Unterberger is the author of numerous rock history books. The first of these, Unknown Legends of Rock ’n’ Roll (1998), profiles underappreciated cult rock artists of all styles and eras; the next, Urban Spacemen & Wayfaring Strangers: Overlooked Innovators & Eccentric Visionaries Of ’60s Rock (2000; also available as revised/updated 2013 ebook edition), features in-depth surveys of 20 underrated greats of the era. Turn! Turn! Turn! : The Folk-Rock Revolution (2002) and its sequel, Eight Miles High: Folk-Rock’s Flight from Haight-Ashbury to Woodstock (2003) cover the history of the 1960s folk-rock movement. Turn! Turn! Turn! and Eight Miles High have been combined into the ebook Jingle Jangle Morning: Folk-Rock in the 1960s, which adds new and updated material. The Unreleased Beatles: Music and Film won a 2007 Association for Recorded Sound Collections Award for Excellence in Historical Recorded Sound Research in the “Best Discography” division of the “Best Research in Recorded Rock Music” category. His most recent books are White Light/White Heat: The Velvet Underground Day-By-Day (2009) and Won’t Get Fooled Again: The Who from Lifehouse to Quadrophenia (2011). His most recent book is Fleetwood Mac: The Ultimate Illustrated History (2016), published by Voyageur Press. Unterberger is also author of The Rough Guide to Music USA, a guidebook to the evolution of regional popular music styles throughout America in the 20th century, and The Rough Guide to Jimi Hendrix. He is a frequent contributor to MOJO and Record Collector, and has written hundreds of liner notes for CD reissues. He teaches courses on rock music history at the College of Marin, the University of San Francisco, and City College of San Francisco. He lives in San Francisco.